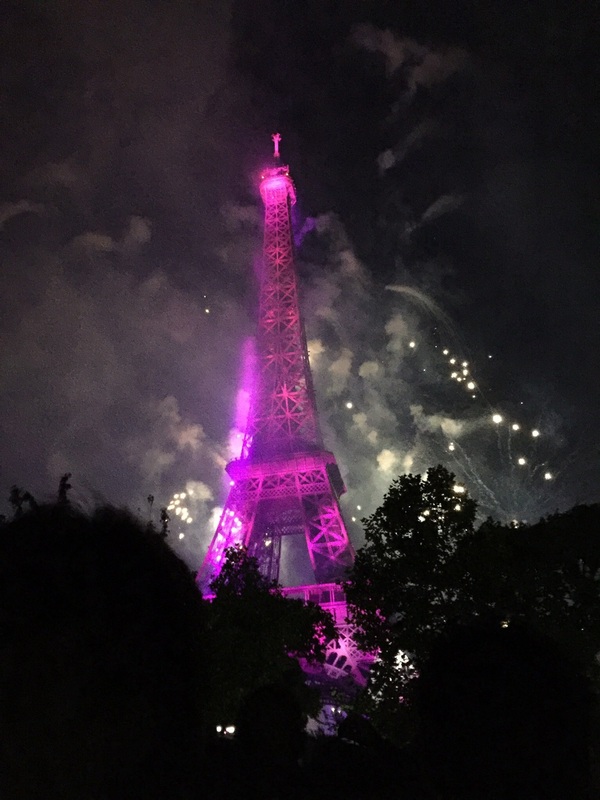 Bastille Day celebrations often begin on July 13, when the pompiers (firefighters) of each arrondissement throw an outdoor party (Le bal des pompiers) from about 9:30pm-4am. (Here's a French article on which arrondissements have the best bal.) There's also a children's party beginning around 8:30pm in the 3ème. We didn't go to a bal because we our children are so young, and we wanted to be up early the next day for the parade. With our little ones in tow, we didn't arrive until 40 minutes before the parade's start, and the Champs-Elysées was already packed with people five or six rows deep from the street. The police had put up barriers between the street and the back of the spectator area; they were screening bags and not allowing any liquids in. Once inside the barriers, we put our kids on our shoulders. No one behind us seemed to mind since they couldn't see much anyhow. The majority of people around us were foreign tourists, but there were a few French speakers as well. Some people had plastic flags that army recruiters had given out, but as Geraldine of Comme Une Française points out, in the past, personal flag displays in France have generally been associated with far right wing political groups. There were big cheers for the pompiers--they're clearly a crowd favorite! This year the parade began with the anti-terrorist units, followed by army troops with backhoes and missile launchers and other impressive equipment in tow. The President arrived at Avenue Friedland, but you wouldn't have know it from where we were. The air force flyover around 10:45 was a highlight--something everyone can see well! There were fighter jets streaming red, white, and blue smoke; then came bombers and helicopters. My three-year-old son wanted to know why the planes weren't "doing rainbows anymore." I admit, the colored smoke was awesome and it would have been great to see them repeat their flyover! Bottom Line: Arrive super early at the eastern end of the Champs Elysées near Clemenceau. There are several free concerts in the afternoon after the parade. This year there was one at Place de la République but we headed to the more kid-friendly Jardin de Luxembourg and enjoyed a brass band from Britain playing old American hits like Walkin' on Sunshine. By far though, the biggest and best concert was on the Champ de Mars just before the fireworks. 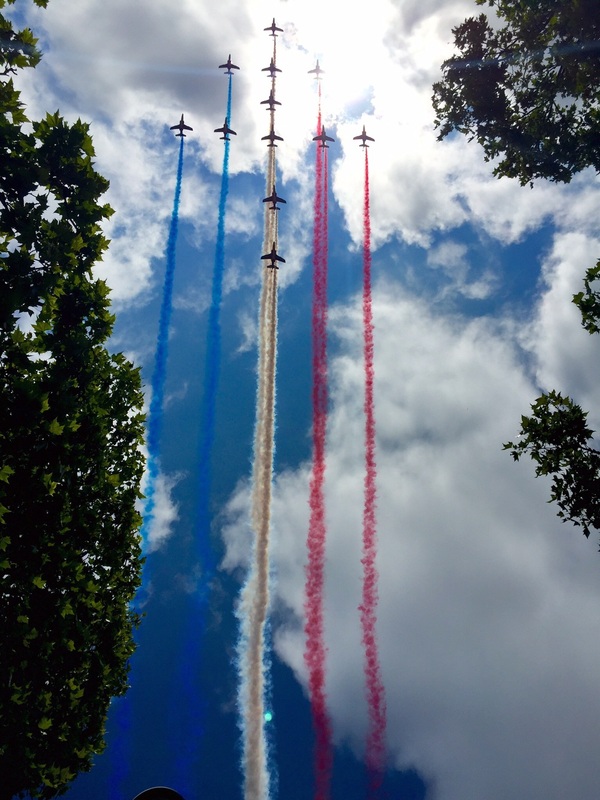 The crowd on the Champ de Mars on Bastille Day 2015. The distant concert stage is lit up under the Eiffel Tower. The park at the Eiffel Tower (the Champ de Mars) is huge, but picnic seating fills up quickly--there were an estimated 500,000 people there this year, and 2 million people watching nearby! Plan ahead and bring a blanket, water or wine, food, cups, & utensils, along with playing cards. By dinner time, the shops around the tower have lines out the door for snacks and drinks, and cafés and restaurants are full. We arrived at 5:45pm and while the main fields were full, we squeezed in to an area to the right of the stage and just behind the fenced-off playground. The free concert was of amazing quality (and televised live in seven countries), featuring the national orchestra of France, the choir of Radio France, Chinese pianist Lang Lang, and international soloists singing songs by Verdi, Puccini, and Offenbach. The concert ended with La Marseillaise and the kickoff of the fireworks. Our infant son watching the tower sparkle during the concert. He slept through the fireworks show, which didn't start until 11pm. 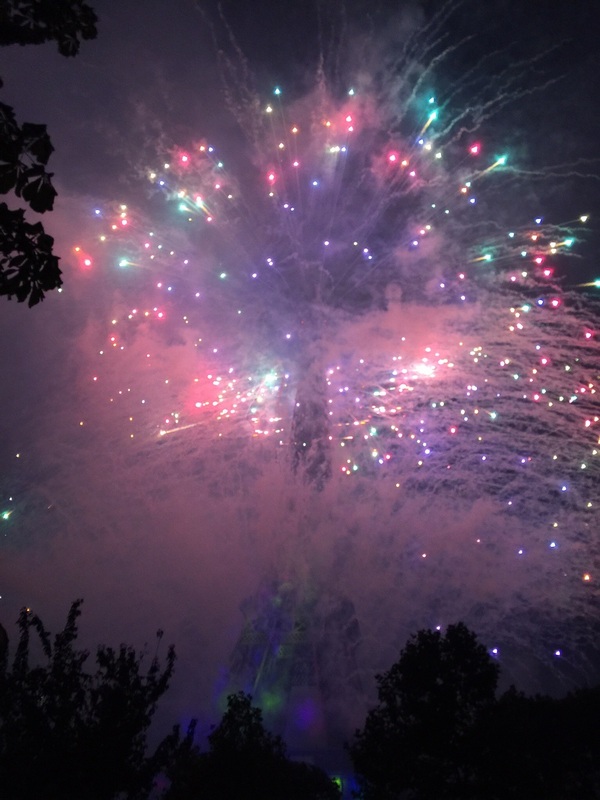 The fireworks show was absolutely spectacular, with 35 minutes of music-themed pyrotechnics launched from the Eiffel Tower itself. The moment it started, the crowd fell silent--it was just jaw-dropping and truly unforgettable. The price, though, for our amazing view was the two hours it took to get back to our apartment, which should have only been a 20 minute metro ride away. The police had closed the stations closest to the tower (including École Militaire), so my husband carried our sleeping three-year-old and we walked our six-year-old to Les Invalides, where overcrowded cars meant we couldn't get on the Metro until 1:30am. (Thankfully, the Metro ran until 2am, one hour longer than usual, for the holiday.) At least it was free that night! Bottom line: the concert and show were truly unforgettable--but while our kids loved it, we felt guilty that it took us so long to get the kids home to bed. Another option would be to watch from the heights of Montmartre or from the (expensive) Bateaux Parisiens on the Seine. What was the most memorable fireworks show you've ever seen? What is the largest crowd you've ever been in?